A recent report published by Infinium Global Research on computer numerical controls (CNC) market provides in depth analysis of segments and sub-segments in global as well as regional computer numerical controls (CNC) market. The study also highlights the impact of drivers, restraints and macro indicators on the global and regional computer numerical controls (CNC) market over the short term as well as long term. The report is a comprehensive presentation of trends, forecast and dollar values of global computer numerical controls (CNC) market. According to report the global computer numerical controls (CNC) market is projected to grow at a CAGR of 6.4% over the forecast period of 2018-2024. Computer numerical controls is a process used in the manufacturing sector in which pre-programmed computer software are used to control the machine tools. It is a method for automating control of machine tools with software embedded in a microcomputer attached to the tool. The program contains the instructions and parameters the machine tool will follow such as feed rate of the material, positioning, and the speed of the tools component. Increasing advancement in the production technology have led to the reduction in time required for manufacturing components with better finish quality is anticipated to be the factor driving the growth of the computer numerical control market. Speed, production rate, and accuracy are some of the main advantages of CNC machining over conventional machining that reduces the human errors. Additionally, increase in demand for mass production plants in various sectors including defense and intelligence, electronics and automobiles are fuelling the growth in the computer numerical control market. 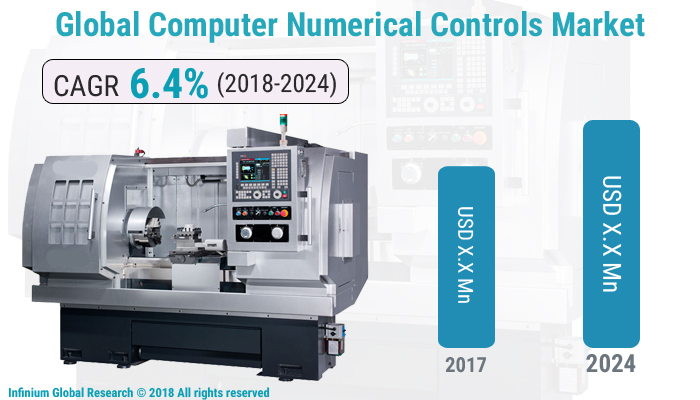 Moreover, increasing efforts to cut down the expenses experienced in employing operators for individual machinery are anticipated to boost the growth of the computer numerical control market. However, high cost of maintenance and after sales services of computer numerical control machines are anticipated to hamper the growth of the market over the forecast period. Furthermore, evolution of internet of things and machine learning technology has led to the development of applications that notify the status of machine to the supervisors PC’s and smartphones. This in turn is anticipated to provide several growth opportunities in the computer numerical control market. On the other hand, integration of CNC technology with high speed CNC hardware highlighting accurate detection and ultra-smooth rotation are providing huge opportunities for the key players in the computer numerical control market over the years to come. Among the geographies, Asia pacific dominated the global computer numerical control system. Asia Pacific is the leading region owing to increased adoption of CNC machines in countries such as India, China, and Japan. Heavy industrialization in the Asia Pacific region can also be contributed to the increasing government initiatives for supporting the growth of the machine tools industry. Furthermore, Presence of a well-established automotive industry in the European region is expected to provide a significant push to the market in the region. The report on global computer numerical controls market covers segments such as, machines type and end-use. On the basis of machines type the global computer numerical controls market is categorized into lathe machines, milling machines, laser machines, grinding machines, welding machines and welding machines winding machines. On the basis of end-use the global computer numerical controls market is categorized into automotive, aerospace & defense, construction equipment, power & energy, industrial and others (consumer goods, metal and mining, and transportation). The report provides profiles of the companies in the global computer numerical controls market such as, Amada Co., Ltd., DMTG Corporation, Haas Automation, Okuma Corporation, Yamazaki Mazak Corporation, Amera Seiki, Hurco Companies, Inc., Shenyang Machine Tool Co., Ltd. (SMTCL), Hurco Companies, Inc. and FANUC CORPORATION. The report provides deep insights on demand forecasts, market trends and micro and macro indicators. In addition, this report provides insights on the factors that are driving and restraining the global computer numerical controls market. Moreover, IGR-Growth Matrix analysis given in the report brings an insight on the investment areas that existing or new market players can consider. The report provides insights into the market using analytical tools such as Porter's five forces analysis and DRO analysis of computer numerical controls market. Moreover, the study highlights current market trends and provides forecast from 2018-2024. We also have highlighted future trends in the computer numerical controls market that will impact the demand during the forecast period. Moreover, the competitive analysis given in each regional market brings an insight on the market share of the leading players. This report will help manufacturers, suppliers and distributors of the computer numerical controls market to understand the present and future trends in this market and formulate their strategies accordingly.